Have you been searching for professional art classes for your child? as you may have already surmised, options are limited. 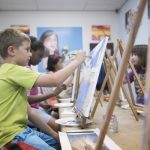 We are proud to be the leaders in our field of bringing professional grade art instruction to families in Henderson and Las Vegas. we use the finest of art supplies to ensure the absolute best results for your child’s progression. our owner, a renowned fine artist herself, has diligently created proprietary curriculum’s for each of our respective mediums, ensuring that no matter which medium or class type, rest assured that your progress is being tracked. Additionally, we incorporate your child’s interests into our curriculum’s, ensuring that they are kept engaged in their work, consistently improving over time. Allow us the opportunity to work with your kids, contact the studio to setup an introductory class, be assessed on your current skill level and learn of areas in need of improvement. After this introductory session, we will find the right date and time for you to join weekly, and begin to see your artistic talents soar with our guidance and support.